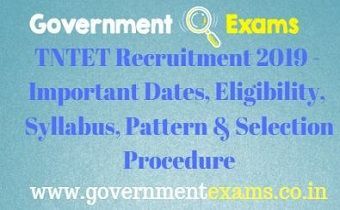 Tamil Nadu Teachers Eligibility Test (TNTET 2019) Application form released on 15th March 2019. Teachers Board Recruitment (TRB) conducts this exam every year for the recruitment of Teachers in the state. There are two levels of TET i.e. Primary Level & Upper Primary Level. Candidates who qualify for paper-I can teach from Class I-V & who qualifies for Paper-II can teach class VI-VIII. Qualified Candidates can teach in any Govt. or Private Schools.